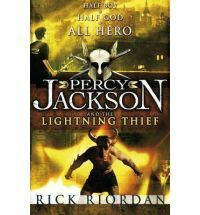 I'll be the first to admit that the Percy Jackson novels are somewhat of a guilty pleasure for me. One can sum up this pleasure simply by linking it with the appropriate drink to have on hand when reading it: some books go well with a red wine, others with a rich port. 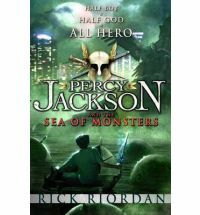 Percy Jackson is best served with a glass of ultra-strong red cordial. In fact, one of the things that's so great about these books is that they're extremely up front about what you're going to get. The usual formula for the first couple of pages is something along the lines of: Percy goes to a new school, and MONSTERS APPEAR! In fact, the MONSTERS APPEAR! theme pretty much sums up the Percy Jackson series as a whole. On the surface, these books shouldn't work. Events happen at break-neck speed. A huge cast of characters comes and goes with alarming alacrity. Sound effects litter the pages. But whether you think that it's because of, or in spite of, all of this, there's no denying that the books are exceedingly good fun. 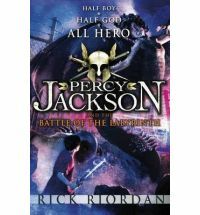 Percy Jackson and the Battle of the Labyrinth is the fourth in the Percy Jackson series, and it brings with it a bit of emotional baggage from the previous few books, which are becoming slightly darker as Kronos's off-stage forces are being mustered. Having seen MONSTERS APPEAR! at his new school, and having caused a bit of a ruckus as a result, Percy is whisked off to Camp-Half Blood, a place of relative safety. Or at least, a place that once boasted this status. Increasingly, its inalienable walls are being breached, a fact that the perspicacious Annabeth, Percy's not-quite-girlfriend, attributes to Kronos and his forces having found their way into the Labyrinth, a vastly complex maze that exists beneath the world as we know it. The Labyrinth boasts myriad doors and gateways, one of which, Annabeth explains, happens to be on Camp Grounds. She fears that it's only a matter of time until the traitorous Luke and the armies of Kronos invade the camp, and makes the point that they need to do what they can to impair the ability of these forces to navigate the Labyrinth. One way of doing so is to obtain a maguffin (ie, mystical item that serves little other purpose than to give the characters something to search for) known as Ariadne's String, which apparently has the ability to show its owner the way through the maze. This string, it turns out, is somewhere in the depths of the maze, in the chambers of Daedalus, the original creator of the Labyrinth. And with that, we're off racing through the Labyrinth and all of its fiendishly complex twists and turns. There are monsters galore, including a hundred-handed cyclops, flesh-eating horses, and all sorts of unpleasant snakey things. Percy and his friends rely on their own ingenuity, deus ex machine galore, and, occasionally, the help of a mortal, to get them through the Labyrinth and to complete their quest. There are some fabulous parts in this book that will set readers guffawing (or tittering, if you're not so much the guffawing type): an encounter with a sphinx who has traded problem-oriented riddles for high-stakes multiple choice tests due to the demands of external accountability is definitely a highlight. There are all manner of great nods to Greek mythology that will no doubt raise a grin here and there, too. In addition, it's been interesting to watch Percy's relationship with Annabeth develop, as well as his growing maturity in his relationship with his mother and new potential step-father. 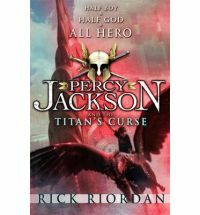 However, while Riordan does tackle some complex themes in these books, they can be overwhelmed by the sheer pace of the action. When they are given some air-time, they contrast strongly with the rest of the narrative, and come across as a touch didactic'a scene where Percy discusses loyalty and filial love with Dionysus comes to mind, as does a brief rumination on environmentalism that occurs towards the end of the book. The break-neck pacing can also serve to diminish some of the more powerful scenes of the book, as there's none of the 'lull' before them that would serve to build tension. The final battle scene in the book, for example, should be far more gut-wrenching and powerful than it is, but unfortunately struggles to stand out against the countless other fight scenes that have come before it. Character and setting suffer a little bit, too, although Riordan does a good job in painting a picture using as few brush strokes as possible. Two areas where I felt this didn't necessarily translate well were the Labyrinth itself, which never felt as vast and complex as it should, and the scene where Percy comes across Kronos, which plays out in a simple and almost caricatured manner. I admit to, from time to time, become a bit lost (pardon the pun) as to the actual reason that they were down in the Labyrinth, as there were several quests happening simultaneously, and all of which seemed rather interchangeable. But in a book such as this, these gripes are minor. None of these things are what Riordan is setting out to do. Riordan's readers are invested in a rollicking adventure story full of heroic and immensely likeable characters, and this is what Riordan does astonishingly well. It's impossible not to cheer for Percy and his friends as they find themselves in all sorts of arcane situations, and hey, a little bit of cleverly reworked Greek mythos on the side doesn't hurt, either. With thanks to'Simple Schooling Classroom for the review copy.